There is a huge imbalance between the Agile promise and what it is obtained with the usual set of Agile engineering practices. The common approach is to use the Agile methods such Scrum and XP as recipes or as a “closed universes”, by using only the engineering practices prescribed by the methods. Any other proven and outstanding practices are rather rarely used. Refactoring is not effective & efficient if the first code is too dirty. We need to go outside the methods and discover what the industry could offer for an Agile Design in order to keep that promise. Introduction – we need to go outside the recipes to put together all the industry strength, in order to fix the imbalance between the used practices and the Agile promise. AGILE PROMISE – an Agile approach should offer good (sustainable, available, effective, efficient) results for adaptive problems/adaptive context (quick, often, even late) (See Agile Manifesto). Engineering support – usually, in the best cases, this support does not go further than these three practices: simple design, refactoring and TDD. What is missing – good enough support for efficiency/effectiveness on: keeping a clean code, business changes or technology changes. We need to define this support for gettting/maintaining an AGILE DESIGN. The roadmap to an Agile Design – we need to find the minimal set of indispensable, context agnostic, design related practices to get/maintain an Adaptive Design and an Adaptive Product. The “recipe” problem – the usual tendency is to use only the “inside methods” design practices and to ignore any other useful practices. For process aspects that support envisioning of the initial design, cleanup of technical debt, quick quality check and adherence to business needs and their changes. For realizing the design principles that support building of adaptive products. Indispensable principles for an Agile Design – Single Responsibility (of a design element), Separation of Concerns (in enhanced mode, with Dependency Inversion), Functional Cohesion, Law of Demeter. Final thoughts: Any of these principles and practices are pillars on getting and maintained an Agile/Adaptive Design Even some of them are rarely used, are already defined and proved by major contributors to Agile knowledge and software industry. Also, my personal experience found the selected practices and principles very useful. If you have any doubts about these things, please review the Agile Manifesto (see [B-AM]) and the main original Agile methods as XP-Extreme Programming and Scrum. Can be easy observed that all the engineering and management practices are especially selected (in the principles and methods) to get good results, but for rather adaptive problems (Scrum explicitly declare that). In order to keep that promise, the used engineering practices must be aligned to the declared goal. In my previous post, I have notified the necessity to build and maintain the software products as Adaptive Product in order to have and maintain the Agile capability. A significant aspect in getting this kind of product is to select and use all necessary design practices to get/maintain this capability: we need an Agile Design as an Adaptive Design. If an Agile practitioner it is asked about this engineering support, the most probable answer is: “we are successfully using refactoring, test driven development and simple design”. All these are great practices and an engineering process that use them could be also great. The question is: if we are using all these practices we could still have significant problems with adaptability? Another question: there are other agile practices that could solve these kinds of problems? The answer is “yes”, but are rarely used. What is missing to keep the promise? All the mandatory design practices necessary to keep the promise must be put together in a coherent set. Now, only XP have a set of core design practices, but is incomplete and does not cover all aspects of an adaptive design. We need to restore the balance – to find an Agile Design as an Adaptive Design that keep the Agile Promise. For that we need to find good enough set of design practices that could provide and cover the main design aspects. Some comments about context dependency: a practice is generic if should be always used and considered and the only context-depended question is “how”. Among the known practices for an Agile design, just a subset are “inside methods” practices, that mean explicitly specified in the Agile methods as XP, Scrum, DAD (Disciplined Agile Delivery). Many other very interesting practices are described by the main contributors to the Agile knowledge, but not as part of some methods. Note (*) – Degree of usage is based on published statistics and by the observable number of references to these practices. Unfortunately, in most cases, only “inside methods” have a larger adoption, because the Agile methods are used as “recipes” (… not in thein intention of the authors) or “closed universes”, where the practitioners avoid to assuming process responsibilities outside the methods border. The consequence: some fundamental practices are rarely used and the resulted products are less adaptive because of their less adaptive design. The Agile promise is broken. We need to find the set of indispensable practices for an Agile Design, but we need to be sure that we have enough coverage for all significant design-related aspects that will help us to keep the promise to be adaptive. 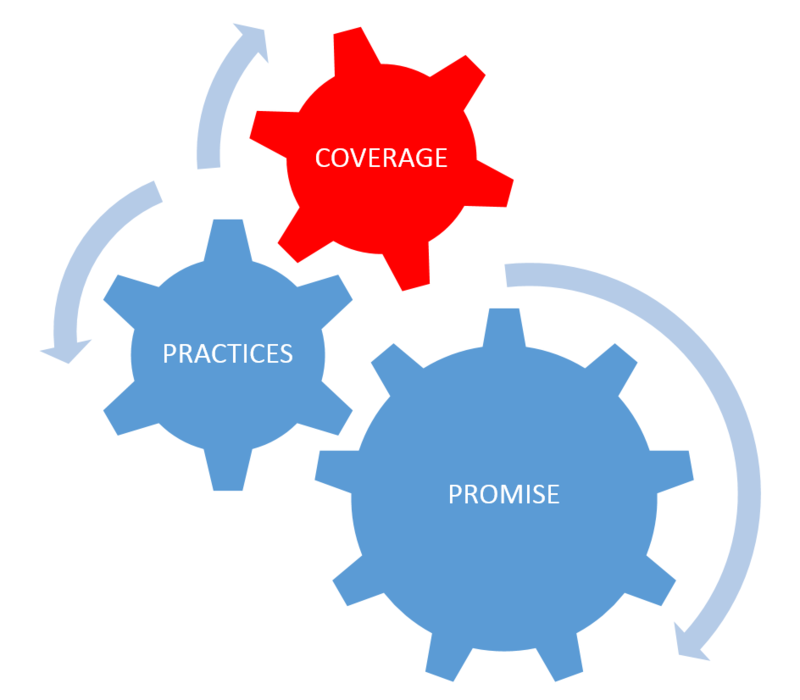 From similar practices are selected the ones with higher coverage. INDISPENSABLE PRINCIPLES FOR AN ADAPTIVE DESIGN – These principles are part of the industry proven experience and are in the top recommendations for a good design a technical excellence. The other reason for including them in an agile related list is the contribution to the “adaptive” property of design. Single Responsibility (of a design element): isolating responsibilities in functions, classes, components, services, sub-systems will make the system easy to build, change and maintain (… where the reasons are already part of the industry experience). Separation of Concerns: that it is a higher level aspect of SR principle, where separation is rather considered at architectural level (layers, sub-systems) and the concerns are also high-level responsibilities (presentation, business, persistence, hardware interfaces, cross-cutting concerns). Each of these concerns could independently change and without decoupling them, the system will not be adaptive. It is impossible to explain that you have an Adaptive Design and you will keep the Agile promise and also do not respect these principles. Simple design – XP: “always do the simplest thing that could possibly work next”. Request to focus only to current requirements, without trying to extrapolate the future ones. After a sequence of small releases, we will have a design properly adapted only to current business needs, not to hypothetically or obsolete ones (“junk stories”). Simple design means to be both focused and clean. TDD – automatic tests, with high coverage at unit test level; the tests should be writing first. XP introduce Pair Programming as essential Agile practices. The main meaning is to have “cooperative programming”. Unfortunately, this practice it is used too literally, only for direct coding activities. Yes, Agile has restored the importance of the coding in the overall development, but let think a little: what is the meaning of “Programming” from XP name? In fact, it is “Development”, where the effective programming/coding has fundamental importance. An XP programmer it is, in fact a multi-role developer involved also in planning, requirements, architecture, and design, coding and testing. In DAD, Scott W. Ambler has introduced the term “Non-Solo Development” for a cooperative development approach that combines various kind of pair-development with solo-development. The Product Backlog it is a very used practice, but its impact in the design is less known. Note: An enhanced variant of the Product Backlog is the (Product) “Work Item List” from DAD. Consequence: less support to effectively connect to change requests and customer feedback in order to get and maintain Adaptive Products. The planning will have no real support , because the necessary work it is mostly unclear. Clean Code as a practice should represent all the small design and design level best practices that are generic, context agnostic and address most generic causes of producing the technical debt. Examples of subjects for clean code rules: meaningful names, functions and class creations, comments, unit tests, building systems, simple emerging design and others. Example of generic rules and (solved) problems: avoid feature envy, misplaced responsibility, make logical dependency physical. Will be activated the causes that produce the most amount of technical debt – the code mess is systematically produced in huge amount. Functional cohesion – the system functions must be visible in its design: various business concerns are separated by design and the technological concerns from the business concerns. The non-functional aspects must be isolated and should be considered as details (! ), because things as the used technologies could always change, but the representation of the core business must survive. Alistair Cockburn proposes the similar concept of Hexagonal Architecture (see [B-HA]), as opposite to un-balanced architectures where only user-interface and persistence are driving the architecture, beyond the business part: “application communicates over ‘’ports’’ to external agencies”. Koni Buhrer proposes the Universal Design Pattern (see [B-UDP]),, which gives little more details than the Hexagonal Architecture and could be a good approach to implement a Clean Architecture. (dramatically) Decrease the effectiveness of TDD, because best criteria of decoupling are not applied and both code and tests will be change too often on business and technological changes. It was also subject of more research and has influence development of more patterns. For Demeter project, Karl Lieberherr created a so called “Adaptive Programming” based on this principle (see [B-AP]). In our days, the Google Talks presentations bring back into public attention the significant advantages of this principle. Using this principle should be a specific way to create objects and functions, a specific way to share and distribute data and information between them: in any part of our code we should not use references to a global context. Respect of this principle it is fundamental to make possible all other best practices: concerns decoupling and functional cohesion. I have selected these practices and principles for an Agile design from the intersection from what I know from the industry experience and my personal experience. The starting point was that no Agile process method has included (from what I know) the Clean Code and Clean Architecture practices and, also, the principles aspect was ignored (exception: the above mentioned Adaptive Programming) . When I tried to categorize the Refactoring and Non-Solo Development, I have added also the process aspect. Later, thanks to a feedback from Scott W. Ambler were added the missing Architecture Envisioning and design modeling practices. I have found almost nothing, and the searches about “Adaptive Design” found results only in furniture domain and was similar for “Agile Design“. That it is part of Agile Modeling method (Scott W. Ambler) and contain: Architecture Envisioning, Iteration Modeling, Model Storming, Test First Design, Refactoring and Continuous Integration. Some comments: I think that Iteration Modeling is a sub-practice of Look Ahead Modeling (but indispensable by itself) and that Continuous Integration is also indispensable.